Sir David Cannadine FBA FRSL FSA FRHistS (born 7 September 1950) is a British author and historian, who specialises in modern history and the history of business and philanthropy. He is currently a Dodge Professor of History at Princeton University, a Visiting Professor of History at Oxford University, and the editor of the Oxford Dictionary of National Biography. He is also President of the British Academy, the UK's national academy for the humanities and social sciences. He also serves as the Chairman of the Trustees of the National Portrait Gallery in London and Vice-Chair of the Editorial Board of Past & Present. Cannadine is married to fellow historian Linda Colley. David Cannadine was born in Birmingham in 1950 and attended King Edward VI Five Ways School. He was educated at Clare College, Cambridge, where he took a double first in history, at St John's College, Oxford, where he completed his DPhil, and at Princeton University where he was a Jane Eliza Procter Visiting Fellow. After completing his graduate work, he returned to Cambridge, where he was a research fellow at St John's College, and was then elected a Fellow of Christ's College and appointed to a university lectureship in history. Cannadine was appointed to the professorial chair of history at Columbia University in 1988, returning to Britain ten years later as director of the Institute of Historical Research at the University of London and, subsequently, as Queen Elizabeth the Queen Mother Professor of British History. In 2008 he joined the History Department of Princeton University and in 2014 he was appointed Editor of the Oxford Dictionary of National Biography and also to a visiting professorship at the University of Oxford. Cannadine has held many other visitorial appointments: at the Institute for Advanced Study at Princeton (twice), at Birkbeck College, London, at the Whitney Humanities Center, Yale, at ANU Canberra, at the NHC North Carolina, at the Huntington Library and at New York University Stern School of Business. Cannadine's many books include The Decline and Fall of the British Aristocracy (1990); G. M. Trevelyan: A Life in History (1992); Class in Britain (1998); Ornamentalism: How the British Saw Their Empire (2001); Mellon: An American Life (2006); The Thirty Year Rule (jointly, 2009); The Right Kind of History (jointly, 2011); and The Undivided Past: Humanity Beyond our Differences (2013). His most recent publications are George V: The Unexpected King (2014) and Heroic Chancellor: Winston Churchill and the University of Bristol (2015). Cannadine is also widely known as a commentator on current events, in newspapers, on the radio and on television; he has been a long-standing contributor to A Point of View, broadcast on BBC Radio 4, as the successor to Alastair Cooke's Letter from America; and he has also written and presented a series of programmes on Churchill's Other Lives. He is the General Editor of the Penguin History of Britain and the Penguin History of Europe. He is currently completing the volume on the nineteenth century for the Penguin History of Britain and editing a book on the history of Westminster Abbey. Cannadine has delivered many public lectures including the Raleigh Lecture at the British Academy (1997), the Carnochan Lecture at Stanford University (2001), the Linbury Lecture at the National Gallery (2002), the T. S. Eliot Lecture at Washington University, St Louis (2003), the George Macaulay Trevelyan Lectures at the University of Cambridge (2007), the Inaugural Lecture for the Centre for British Studies at Humboldt University, Berlin (2010), the Crosby Kemper Lecture at Westminster College, Fulton, Missouri, the Jon Sigurosson Lecture at the University of Iceland (2012), the Haaga Lecture at the Huntington Library (2012), the Creighton Lecture at the University of Toronto (2013), the Robb Lectures at the University of Auckland, New Zealand (2015), and the Wolfson Anniversary Lecture at the University of Glasgow (2015). Cannadine has served as a Vice-President of the Royal Historical Society (1998-2002) and as a member of the Advisory Council, Public Record Office, subsequently National Archives (1999-2004); as a Trustee and Vice-Chairman of the Kennedy Memorial Trust (1999-2010); as a Trustee, Vice-Chair and Chair of the National Portrait Gallery (2000–12); as a Commissioner of English Heritage (2001–09) and as Chairman of its Blue Plaques Panel (2006–13); as a member of the Royal Mint Advisory Committee (2004–14); and as Chair of Churchill 2015 (2013–15). Cannadine is currently a member of the Bank of England Banknote Character Advisory Committee; he is a Trustee of the Rothschild Archive, the Gordon Brown Archive and Gladstone's Library; and of the Library of Birmingham Development Trust, the Royal Academy Trust, Historic Royal Palaces and the Wolfson Foundation. He is also a Vice-President of the Victorian Society, Vice-Chairman of the Westminster Abbey Fabric Commission, and of the editorial board of Past and Present and President of the Friends of the Imperial War Museum. Cannadine has been elected a Fellow of the Royal Historical Society (1981), a Fellow of the Royal Society of Arts (1998), a Fellow of the Royal Society of Literature (1999), a Fellow of the British Academy (1999), and a Fellow of the Society of Antiquaries (2005). 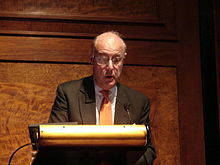 he has been awarded the Lionel Trilling Prize (1991) and the Dean's Distinguished Award in the Humanities (1996) by Columbia University, the Dickinson Medal by the Newcomen Society (2003), the Minerva Medal of the Royal Philosophical Society of Glasgow, and the Norton Medlicott Medal of the Historical Association. Cannadine holds honorary degrees from the University of the South Bank (2001), the University of East Anglia (2001), the University of Birmingham (2002), and the University of Worcester (2011). He is an Honorary Fellow of the Institute of Historical Research (2005), the Historical Association (2011), Christ's College, Cambridge (2005), and Clare College, Cambridge (2012), and an Honorary Churchill Fellow of Westminster College, Fulton, Missouri (2012). He was knighted for "services to scholarship" in 2009. In April 2018 Cannadine was elected an international honorary member of the American Academy of Arts & Sciences. ^ "Professor Sir David Nicholas Cannadine" (PDF). Princeton University. Retrieved 25 July 2010. ^ Kelly Boyd, Encyclopedia of Historians and Historical Writing (1999), p. 926. ^ "No. 58929". The London Gazette (Supplement). 31 December 2008. p. 1. ^ "British Academy President and Fellows elected to American Academy of Arts & Sciences | British Academy". British Academy. Retrieved 30 June 2018.